Here’s a fun and creative way for kids to tell the story of their summer or launch their own comic series. How to create and draw cartoon characters is the subject of a five-day class for kids ages 8 to 18. It’s offered at the Berkeley Art Works, beginning Monday, July 21, from 9 am to 12 noon. 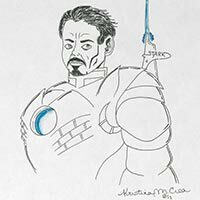 Instructor Kristina Hoffman will also teach how to develop the storyboard and put those ‘toons into comic panels. The Story Board class begins Monday, July 28 for five days, also from 9 am to 12 noon. Online registration helps assure a place in the class. The Berkeley Art Works is located at 116 North Queen Street in downtown Martinsburg and features a co-op artists sales gallery, exhibitions by local and invited artists, and features workshops and classes for adults and young people. The Berkeley Arts Council is a nonprofit, all volunteer organization that provides equal opportunities in the arts.